Swiss Chalet or Atomic Ranch? 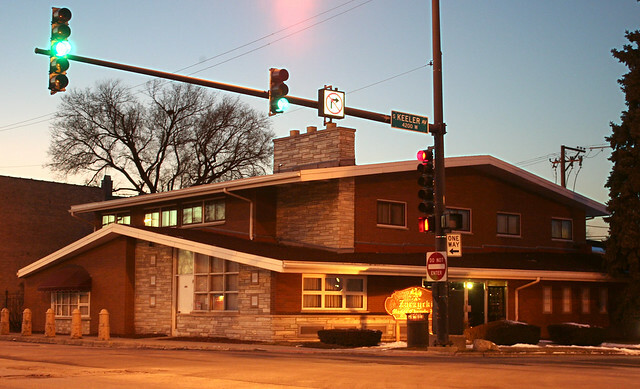 An occasional recurring theme I’ve found on Chicago’s Mid-Century south side is the Swiss chalet look, a vaguely historicist style heavily filtered through the lens of Chicago’s 1960s builder vernacular. These buildings may feature broad, shallow-pitched roofs, rough-cut stone and brick siding, generous overhangs, and ornamental wood railings, brackets and shutters. The apparent intention is to invoke the cozy security of a warm ski lodge, well-defended against the cold of winter. Lyons, in particular, has quite a few of them. Readers may note that the list of features isn’t too dissimilar to what one would find on a typical mid-century ranch house, and it’s a blurry line at best between the “atomic ranch” and the “Mid-Century chalet”. 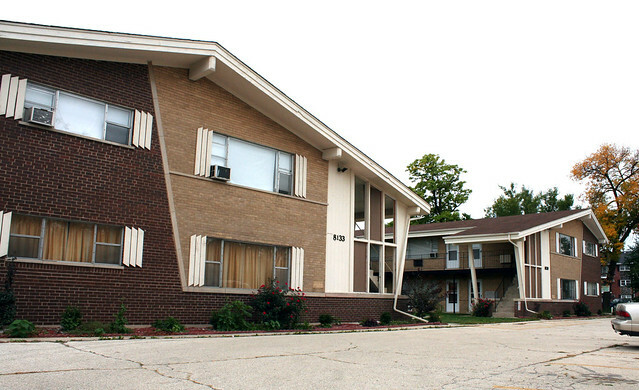 A pair of L-shaped breezeway apartment buildings apartment buildings, built circa 1963. Note the free-standing screen wall with the plastic window panels, protecting the stairway – it recurs on the next two structures as well. A group of five related buildings, with fieldstone and brick patterns across their facades. The two end buildings are L-shaped structures with the “Swiss chalet” design, while the three in the middle are more conventional flats. Built by Olsick & Gaw (later Olsick-Gaw-Hartz), architect unknown. 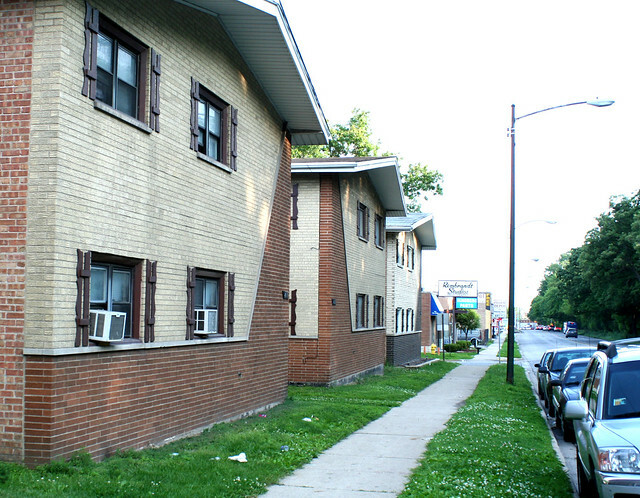 Above: the western most building, 6324 W. 63rd Street at S. Mulligan. 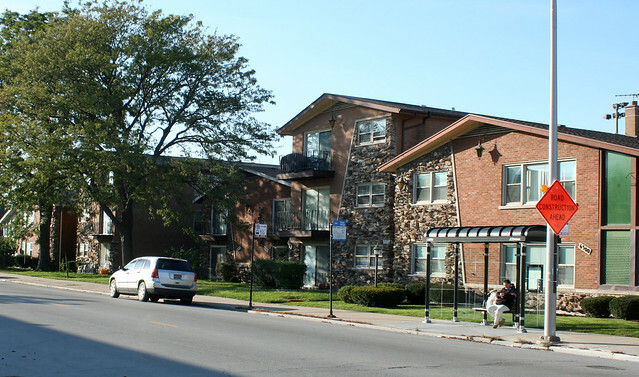 A breezeway apartment building, with the same stair screen and facade design patterns as the two previous groups. Whoever designed this one almost certainly did the previous two groups as well. If the Swiss connection weren’t clear enough, this split-personality building calls it out explicitly – as did its original name, the Chalet Motel. Built circa 1962; D.F. Hedg, builder. Part of a larger grouping of apartments, these three buildings have the same shallow-pitched roof, and the same facade pattern with a sharply angled change in materials – not to mention those same corny shutters. In the 1980s, it was Sullivan’s Motel. The broad drive-in overhang, the massive brick pillar, and the wood balcony evoke the Swiss Chalet style. Opened in 1961, this swooping Mid-Century motel offered “early Americana decor”… as well as integrated auto service right next door. Originally advertised as a family vacation destination, it has fallen on somewhat harder times in recent decades. 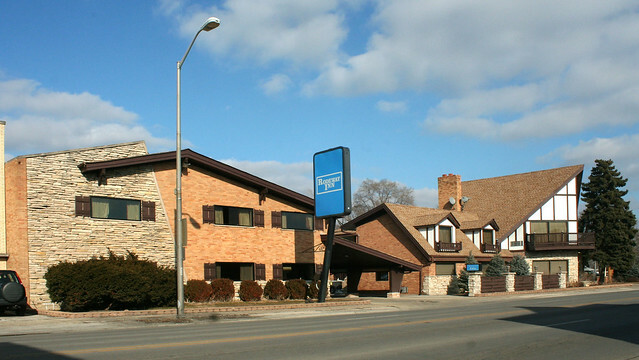 Like the Plank Road motel, this one has a broad pitched overhang, with massive stone pillars. Where to stop? In the world of builder vernacular, the lines are never clear. This funeral home has the low pitched roofs, the massive chimney, the flagstone siding… but no brackets, no massive overhangs. Does it count? Is it just a close cousin, or a similar result arrived at through totally different influences? Without knowing the mind of the builder, it’s hard to say. The Zarzycki Manor Chapel building opened circa 1963, and has been in continuous operation here ever since. 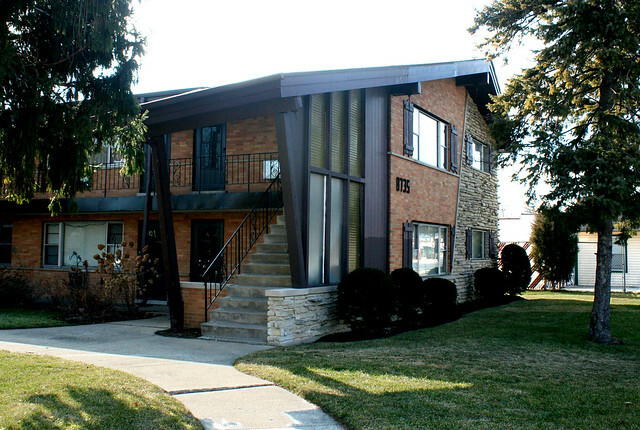 And finally, there is the Chalet Nursery, in Wilmette – a place which, abysmally, I have never photographed. Click here for a Google StreetView image. The oldest portion is a pre-war building, but a large expansion was added in the 1950s. 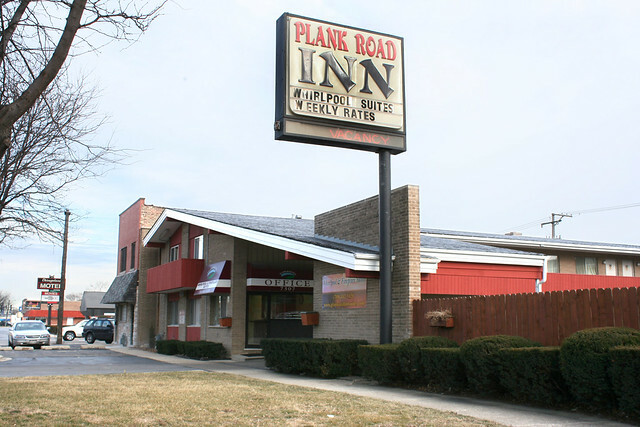 This entry was posted in Midcentury Modernism, South Suburban. Bookmark the permalink. I expect at some point over the next year to be in front of high school teachers in rural southeast Missouri, and I’m planning on making the same pitch . . .
@Stephen – thanks so much for the kind words! I would add one additional element: time. If I had unlimited time, Built St. Louis would be vastly more comprehensive than its current state. As is, I’ve hardly had the chance to touch it in the last year or so, even as I keep returning to St. Louis and gathering more and more data. I am possibly relocating to chicago and would love to find a mid century mod or a atomic ranch in or near chicago. Any suggestions on safe places to look under 300k?